What is Gemstone Certification & Why It Is So Important? Gemstone certification means to evaluate a piece of gemstone on the basis of different quality parameter’s which have been established by the gem industry to determine the quality and other characteristics of different gemstones. A gemstone expert has been appointed to subtly examine or measure the minor details of a stone and issue a detailed report based upon the conclusion of gemstone inspection. The report, which is issued by a gemologist or gemstone expert is referred to as a certification report. A gemstone certification report incorporates all measurements of the characteristics of a stone evaluated by a trained gem expert. 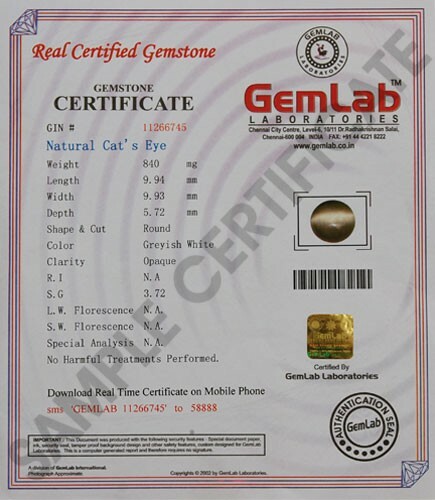 The need of cat’s eye gemstone (Lehsunia in Hindi) certification arises due to the presence of a large number of fake gemstone dealers in the market who dodge their customers by selling them synthetic or fake gemstones. Thus, a gemstone lover should buy cat’s eye or other precious gemstones from establishing gem laboratory that will particularly examine in detail or description small details of gemstones such as its color, shape, chemical compositions and treatments. On the basis of above to find a proper report is prepared which incorporates subtle details of a particular gemstone comprising its weight, carat, color, inclusion, treatments, shape, refractive index, beryllium treatment etc. Hence, a gemstone certification report discloses minute details about a cat’s eye stone. Therefore, a user who wants to purchase a cat’s eye stone gemstone must opt for those dealers who offer gemstone certification along with gemstones. A certified gemstone is examined by a trained gem expert who meticulously evaluates or inspects a particular stone on different parameters to judge the quality of the stone. Hence, it is advised to buy a certified gemstone because it is being analyzed by a trained gemstone expert thus stone succeeds on the quality parameter. Due to an increase in demand for gemstones and lack of awareness among users about the gemstone certification. Many gem sellers are either selling gems without gem certification or issuing false gem certificate which has no value and use. 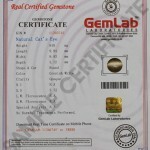 However, it is extremely difficult nowadays to find a genuine gem certification lab, which has built a reputation and name in the field of gem certification. Gemlab Laboratories have gained reputation and higher standard in the field of gemstone and mineral certification. This laboratory has gained reputation and popularity for gem certification due to their legit certification of all stones and dedication to work laboriously to cater the demand of all users to acquire certified natural cat’s eye and other gemstones.